There are no late fees for overdue books in elementary school, and lately I’ve noticed that the 4th, 5th and 6th graders have been, shall we say, “extremely casual” about returning their books promptly. Three months is too long to keep others from reading a great book. I know and admire other elementary librarians who can inspire students to return books on time with just a stern look and some pointed questions. I wish I had this skill, but I have to go with my strengths. 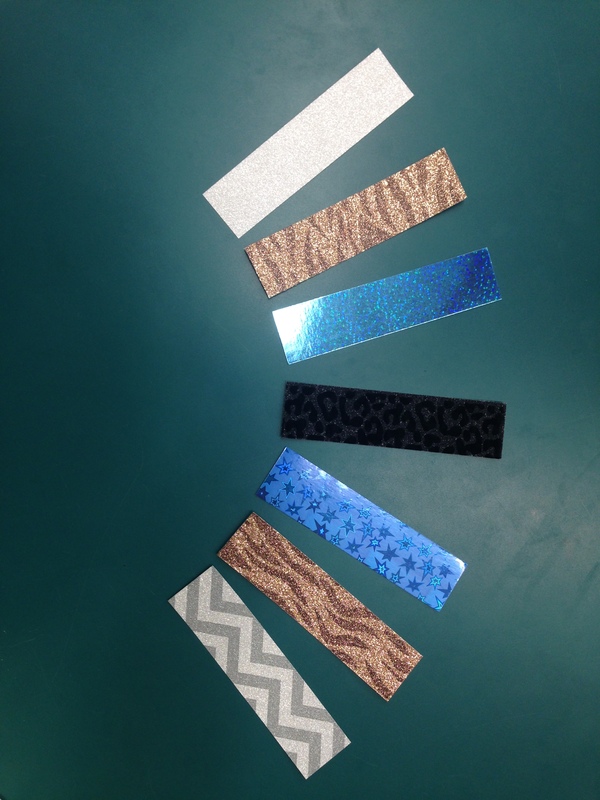 I’m more about rewards than coercion, so when I found the glittered, flocked, and holographic chevron, leopard print, tiger stripe, sparkly, flaming card stock on clearance at Michael’s for $.49, I grabbed up every 12″ X 12″ sheet and cut each one into 16 bookmarks. I’ll do the math for you: that’s 3 cents a bookmark. I gave every 4th-6th grade teacher one bookmark for advertising purposes, and asked them to let their classes know that every student that did not have overdue books on their library day the following week would be given one of these bookmarks. I also gave the teachers a printed list of overdue books, instead of the usual automatic emailed list that Destiny sends. In a busy teacher’s day, one more email with an attachment just doesn’t always get opened. Almost immediately, books started arriving from everywhere–closets, cars, grandma’s house, under beds, in sibling’s rooms, and in backpacks. It was like having a book magnet drawing them back to the library! I was very pleased with the results, and I didn’t have to give anyone the stink eye. Leave a comment if you have a method of getting books returned on time.